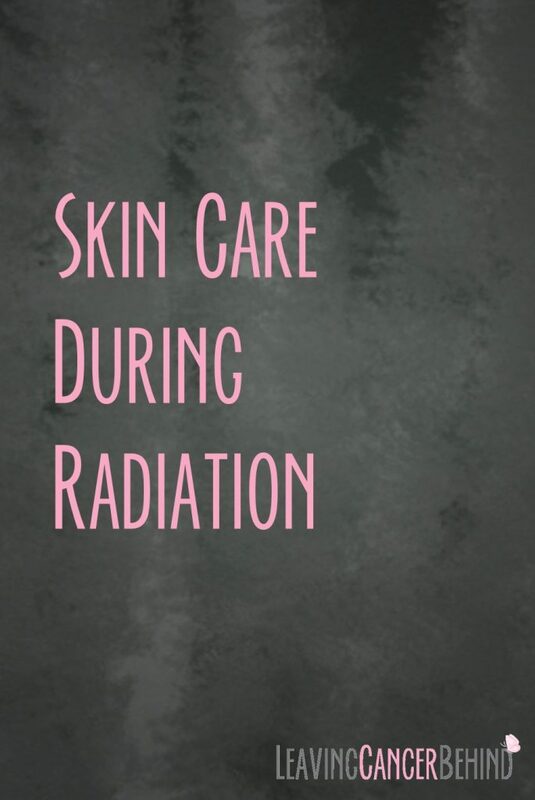 That pretty much sums up my skin care during radiation. It just amazes me how different everyone’s treatments are and how differently we all respond to them. This is what worked for me. I always enjoy hearing what’s worked for other people and a few of the products above were used as a result of recommendations from a few friends. Not pictured – WATER!! I drank a ton of water. I was thirsty ALL THE TIME. I can’t tell you if that was a result of radiation or from starting a 30 day workout challenge the second week of radiation. But whatever the case, I drank a lot of water, which is always good for your skin. Tom’s of Maine deodorant – My deodorant couldn’t have any metal in it so they recommended this one. Fortunately, (or unfortunately depending on how you look at it) we’ve had horrible weather this summer in the Seattle area. So I was never really hot and didn’t have any problems with stinky arm pits. I was also told not to use a regular razor under my arm, because if I cut myself, the skin would not heal. After a few weeks the hair in the treatment field fell out and toward the end I shaved the part not being treated. Not sure if that was a good idea, but I did it anyways. 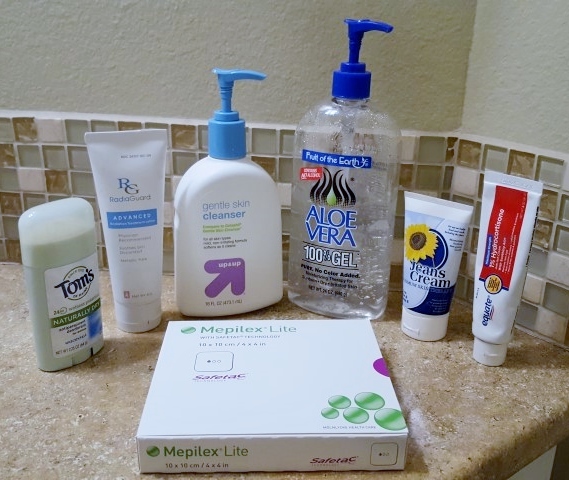 Gentle Skin Cleanser (generic for Cetaphil) – This is what I used as soap on the treatment area. I just put it on lightly with my hand and rinsed it off in the shower. I did not use a wash cloth. Aloe Vera 100% Gel – This is what the Dr., nurses and technicians recommended. I put it on after I showered in the morning and then again at night (and continue to do so as it’s still healing). MAKE SURE to find out where the exit sites are and put it on there as well. I didn’t notice any changes in the skin on my back until the end of treatment and I had not been putting Aloe Vera far enough over on my back. I just have a tan back there, but Aloe Vera might have helped, had I known how far over to put it. Jean’s Cream – I put this cream in my purse and put it on in the dressing room right after treatment each day. It’s not cheap, but you only need a little. This was given to me by a friend who found it helpful during her radiation and I ended up buying one more during treatment. Our 11 year old has also used it on eczema on her eye and it has worked really well for that. 1% Hydrocortisone cream – Skin itches as it heals! Ugh!! I hate itching. This helped relive the itching a little. Mepilex bandages – I saved the best for last!! When my skin was feeling super irritated by the end of treatment, right before my 8 day boost, the nurse gave me these! Ahhhhhhh!! They are amazing. It’s a lightly sticky bandage that you can put over the skin. It made it so the seatbelt and my bra didn’t bother me. I could also gently scratch on top of the bandage which felt nice. I put Aloe Vera on the very irritated part and then put the bandage over it, making sure there is enough dry skin for the bandage to stick to. The nurse gave me 4 and then sent away for the rest and they billed my insurance. You can buy them on Amazon as well, but they are expensive. I have found them to last 2 days, but they could probably last 3. I take them off to shower and for treatment and then put them back on afterwards. I hope this is helpful to anyone currently going through treatment, or getting ready to go through it. Feel free to share the post! If you have any questions or know of other products that are helpful, please leave a comment below!